Except where otherwise expressly indicated herein or in the Application, this Policy applies only to information collected through the Services and not to information collected outside of the Services. Anyone who visits, browses, downloads, or otherwise uses the Services (collectively, “you” or “user”) is subject to this Policy. Before submitting any information in connection with your use of the Services, please read this Policy. By using the Services, including the submission of any personal information, you acknowledge that you accept the practices and policies outlined in this Policy and consent to having your data transferred to and/or processed in the United States and other countries where Powermat has facilities. If you do not agree to this Policy, you are not permitted to use the Services. 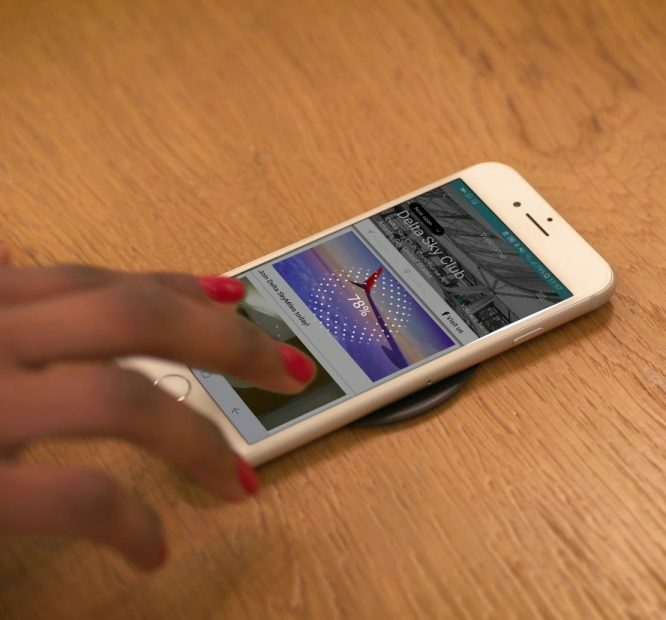 The Services provide tools that permit users to wirelessly charge supported mobile devices in various public spaces and locations that have Powermat Spots. We collect the following four categories of information from you: (A) Personally Identifiable Information; (B) Non-Personal Information; and (C) Passive Information (D) location data. All four of these categories are collectively referred to as “Information” in this Policy. It is important to note we collect Personally Identifiable Information (PII) only if you select to sign in with your personal details. We may receive and store any information you enter through the Services that would allow us to identify you personally or contact you or identify other individuals. This information is referred to as Personally Identifiable Information (“PII”). The PII you provide to us only will be used by Powermat in accordance with this Policy. Any PII you provide about yourself or others when you send us an e-mail, contact support or otherwise communicate with us. Information related or connected to a social media account that you use to sign up or log in to the Services, or when you associate that account with our Services. For instance, when you associate your Facebook account with our Services, we may receive your public profile (name, profile picture, age range, gender, language, country and other public information), your friend list and your email address. If you sign up, log in with or associate other social media accounts with our Services, such as Twitter, Google+ or Tumblr, we may obtain similar information from those platforms. Other Information you may provide to us, such as to receive free services, enter a sweepstakes or contest, or make inquiries to us. Powermat does not collect, store or otherwise maintain financial information such as credit card, bank account or similar other financial information. All Personally Identifiable Information (PII) collected by Powermat mobile application is stored in: (A) Amazon Web Server located in Virginia, USA. All Personally Identifiable Information (PII) collected Powermat Website(s) is stored in: (A) Microsoft 365. (B) Salesforce. From time to time, we may ask you to provide us with or permit us to collect non-personal information, which is data that alone is not intended to allow us to identify you personally, such as just your location information. This non-personal information may include precise GPS location and BLE / iBeacon micro-location if you choose to permit the Services to collect this information, or less specific location information, such as the city, state and country in which you are located when you download the Application. Sometimes, Powermat will aggregate and/or anonymize PII so that it becomes non-personal information and is not intended to be used to personally identify you. We and our third party partners, such as the operators of Charging Spots or third party vendors that provide analytic services to us (collectively, our “Partners”) may automatically collect certain types of passive information when you use the Services, including the receivers that must be attached to your device to permit wireless charging (the “Receivers”). For instance, we may through your device and/or the Application (including through your use of the Charging Spots), collect identifiers such as an IDFA (for iOS) or AAID (for Android), or your device hardware model, operating system version, or your network provider. We (or our Partners) may also collect service usage information, frequency of users of the Service, pages, forms or screens visited, status of a charging session, and similar data that is associated with your mobile device, your Receiver, or your use of a Charging Spot. This data is used for purposes of providing services to you, analyzing and improving our service and providing diagnostics and support functions, and may also be used in the aggregate as a statistical measure. This information can be used to identify a device that is using the Services and information concerning a session in which you are charging your device, such as the device that is being charged, the start and stop times for charging, the location where such charging is taking place, and the history of purchases made through the Services. You can use your wireless device to obtain the Application for free through third party marketplaces, such as the Apple iTunes store or Google Play store. The Application, as well as the operating system for your mobile device (Apple’s iOS or Android) may provide additional functionality by using a variety of device location tools. These include: (i) the precise location of your wireless device using the device GPS functionality or BLE/iBeacon micro location services; (ii) the precise location of a Charging Spot that you are using to charge your device; (iii) broader location information, such as the city, state and/or country where you were located when you download the Application; (iv) your device identifier, IP address, or operating system; and (v) usage information. For instance, if you desire, the Services may use your location information to help you find locations of Charging Spots so that you may charge your device. You will be (or have been) notified of this location functionality upon installation; if at any time you no longer wish to have this functionality enabled, your sole choice (unless we provide another option, at our discretion) is to uninstall or disable the Application on your device. You also may be able to control location settings through your device settings on your mobile device operating system (e.g. iOS). To allow you to use the Services and to administer your account. To communicate with you including, without limitation, responding to your questions or comments, or to contact you for feedback regarding us, advertisers or Partners. For Powermat’s and our Partner’s marketing and promotional activities, or to provide information about our products and services, under the condition you have opt-in to receive notification, this without the discloser of user identifying details. To provide you with tailored advertising and/or offers, which is explained in greater detail in Section IV below. To report to our advertisers and partners in an aggregated matter regarding use of the Services, this without disclosing of user identifying details. To provide you with functionality changes to the Services or new Powermat services. To customize, personalize, analyze, evaluate, adjust and improve the Services to meet the needs and expectations of you, Powermat, our affiliates, advertisers or Partners. To anonymize or aggregate PII for various purposes like market analysis or traffic flow analysis and reporting and other internal purposes. To enforce our agreements with you, prevent fraud and other prohibited or illegal activities, and generally to ensure that we comply with applicable laws. To allow our Partners or the operator of a premises where a Charging Spot is located to contact you or provide you with a promotion or offer, this without the discloser of user identifying details. The Application includes tailored loyalty services which enables customized offers and promotion in the Application while you are using the Services. When you use the Services, we may use passive information and/or information collected electronically through your mobile device and the Application, which may include ad identifier (adID) and other mobile device information such as (or functionally similar to) that listed below. This information may be used by Powermat to provide customized promotions and offers, to perform analytics concerning those promotions and other applications or mobile activity. These technologies also may control the number of times you see a given ad, deliver promotions that relate to your interests and measure the effectiveness of ad campaigns. Logged and/or collected data may, but does not necessarily include IP address, advertising identifiers, types and languages, session information including date/time stamp, device make and model, referring and exit pages, operating system and version, clickstream data, precise geo-location information (such as GPS-level data), clicks on offer or promotion, offer(s) or promotion(s) served, length of time an offer or promotion was visible, size of the offer or promotion, offer and promotion response (if any), device applications, the city, and general online and service-specific usage data and usage metrics. Powermat Partners. In order to provide you access to Charging Spots and to offers and services that we and/or our Partner think you will find valuable, we may share any information collected through the Services with our Partners who operate the premises where Charging Spots are located. Information is disclosed to third parties in a manner that is not intended to identify you personally and does not include PII. For instance, if you are near a Charging Spot or using a Charging Spot, one of our Partners may send you an offer or promotion for their products or services. We may also share Information with our subsidiaries, where subsidiaries help us to provide you with services or products you have requested. A “subsidiary” is an entity in which we own all or part of the shares in that entity. Service Providers. We may share Personally Identifiable Information (PII) with third parties who perform services on our behalf. These may include, for instance (without limitation), hosting providers, data processing services, consumer and technical support providers, and other service providers who help us provide you with Services. We contractually require these third party service providers to protect your PII. These service providers do not have the right to use or transfer your PII for any use aside from performing services on Powermat’s behalf. Business Transfers. Information may be transferred or disclosed as part of any merger, acquisition, sale of some or all of Powermat’s assets or transition of service to another provider. In the unlikely event of an insolvency, bankruptcy or receivership, Information also may be transferred as a business asset. In this case Powermat will inform the data Subjects of the change in the corporate ownership. Non-Personal Information; Aggregated Personal Information and Passive Information. We may share with third parties non-personal information, aggregated personal information that is not intended to allow these third parties to identify you or passive information, except for passive precise location information which is addressed below. Your Location. If you choose to activate the Charging Spot locator in the Application, which uses the GPS function and BLE on your mobile device, we may share such location data, (which we’ve also referred to above as “precise location” data), with our Partners who operate or maintain the premises where Charging Spots are located. Personal Information is aggregated in a way that is intended not to allow these third parties to identify your PII when you are using a Charging Spot. Information may be shared with our Partners even if you turned off the Charging Spot locator tool in the Application. In addition, non-precise information about your device’s location based on information such as an IP address may be shared with any partner. In the event that you wish to complain about how we have handled your personal data, please contact Data Protection Officer at privacy@powermat.com or in writing at Powermat Technologies LTD., Neve Ilan, Israel, 9085000. Our Privacy Officer will then look into your complaint and work with you to resolve the matter. If you still feel that your personal data has not been handled appropriately according to the law, you can contact Information Commissioner’s Office (ICO) in the UK and file a complaint with them. California Civil Code Section 1798.83 permits users who are California residents to request and obtain from us once a year, free of charge, a list of the third parties to whom we disclosed their personal information (if any) for direct marketing purposes in the preceding calendar year and the categories of personal information disclosed to those third parties. If you wish to make such a request or have any questions about Powermat’s information sharing practices, you may contact us by sending us an email to privacy@powermat.com. When you visit our websites, we may collect certain information from you. This information falls into two categories: (A) personal information you voluntarily supply when you send a query on our Websites and (B) tracking information collected as you navigate our websites. We may disclose the information you provide to us through the website for any of the reasons listed above in Section III. We may retain and use for our business purposes personal information (and any other information) you provide to us. For instance, if you provide us with your email address, or enter a sweepstakes we offer and opt-in, we may send you offers or newsletters, through a variety of online and offline channels. (We will provide you with an opportunity to opt out of these communications.) This includes information that you post to our site (such as if we offer you the opportunity to post to forums). Cookies are small, unique strings of code stored on your computer that make it easier for you to use our site and help us improve site functionality and security. We may use both session cookies (which expire once you close your browser) and persistent cookies (which stay on your computer until you delete them). The Services may contain links to third-party websites or applications. Please be aware that Powermat cannot control and is not responsible for the information collection practices of such websites or applications, which may differ from those of Powermat. We encourage you to review and understand the privacy policies and terms and conditions of these web sites and applications before providing any information to them. We use a variety of industry-accepted tools and safeguards designed to protect your Information and our systems from unauthorized access and disclosure. On the other hand, Powermat has no control over the security of other websites or applications that you might visit or use even when a link to those websites or applications is available in or through the Services. It is important to us that you feel confident using the Services. However, no system can be completely secure. Therefore, although we take commercially reasonable steps to secure your Information, we do not promise and you should not expect that your Information, activity on the Services or other communications is guaranteed to always remain secure. The Services are not intended for persons under the age of 16: if you are under 16, you do not have permission to use the Services. Powermat does not knowingly market to or solicit information, accept service or collect information from any person under the age of 16. If Powermat becomes aware that any person submitting information to the Services is under the age of 16, we will attempt to delete the account and any related information as soon as possible. Any ratings for the Application provided by a third party shall have no bearing on this limitation. We may occasionally update this Policy to reflect changes in our practices. When we post changes to this Policy, we will notify you through a conspicuous post on our website and/or through the Application, an email, or another means reasonably calculated to provide you with notice, provided that material changes will become effective thirty (30) days (or such longer term we may designate) after such notification. By continuing to access or use the Services, the Powermat Application or Charging Spots after the effective date of any such change, you agree to be bound by the revised terms of this Policy. If you do not wish to agree and abide by any such revised Policy, Powermat shall have no further obligation or liability to you under this Agreement or otherwise, and you shall not be entitled to any compensation or other payment, remedy, or recourse. A “material change” is a change to this Agreement which reduces your contractual rights or increases your responsibilities under this Agreement in a significant manner. The Services are provided, supported and hosted in the United States, Europe, Israel and other countries; however, use of the Services is governed by the United States and European law. If you are using the Services from outside the United States or the European Union, be aware that your Information may be transferred to, stored and processed in the United States and other countries where our facilities are located. Powermat data protection is lawfully compliant with the data protection laws of the United States and the European Union and might not be as comprehensive as those in your country. By using the Services, you consent to your information being transferred to our facilities and to the facilities of those third parties with whom we share it as described in this Policy. If you have any questions about Powermat generally, this Policy or the Services, please feel free to contact us by sending an email to privacy@powermat.com.